Having a house made out of cob leads to a lot of curious visitors. For the most part they all react the same. There is always a certain level of mistrust for walls built out of sand, clay, and straw, and their ability to support the weight of the sod roof which currently is carrying a large snow load as well. However, the dismay of many isn't the fact that we live without a refrigerator, have a house footprint of under 400 square feet, or have to lug drinking water into our house every few days, but the fact that we have a toilet that requires emptying. Somewhere along the path to modernity, society deemed human waste a product that needed vast quantities of clean water to wash away. People are disgusted by the fact that our waste isn't immediately disposed of in a place out of sight and therefore out of mind. Additionally, the thought of re-purposing such material is viewed as quite disgusting. However, here follows an explanation of how our "waste" becomes a product. For those truly interested in learning how to start a composting toilet or do any composting in general, I highly recommend the book "The Humanure Handbook" by Joseph Jenkins. This is where we have found the majority of our information pertaining to composting toilets. The process of composting human waste is very simple. Collect, compost, use. In truth there is more to it than those three steps, but not much more. Each time we use the toilet a fresh scoop of sawdust gets placed on top. This organic material has loads of Carbon and balances the amount of Nitrogen found in human waste; both are needed for a compost pile to function properly. We empty our toilet roughly every five days into a larger pile that I built using pallets. 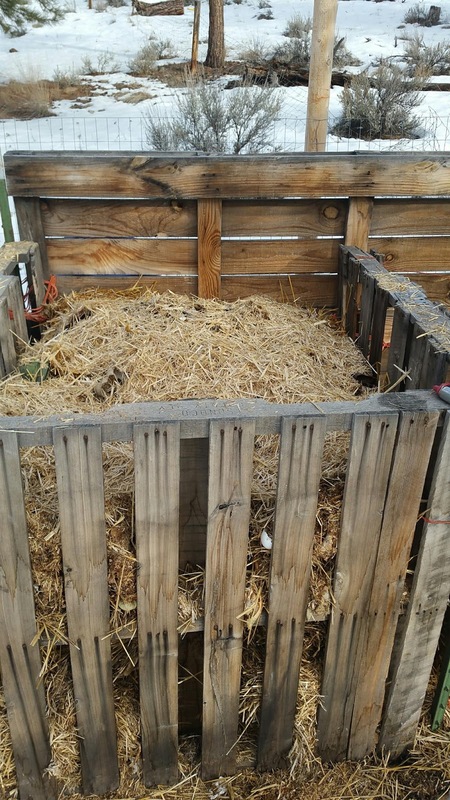 This open compost bin gets fresh straw every time a bucket is emptied and will collect an entire years worth of compost materials before sitting for an additional year to break down. The big question is "Does it smell"? The answer is "No". Those skeptics of a system like this will undoubtedly not believe that a huge pile of human waste doesn't smell, but those who brave using our bathroom find that it smells just like anyone else's. 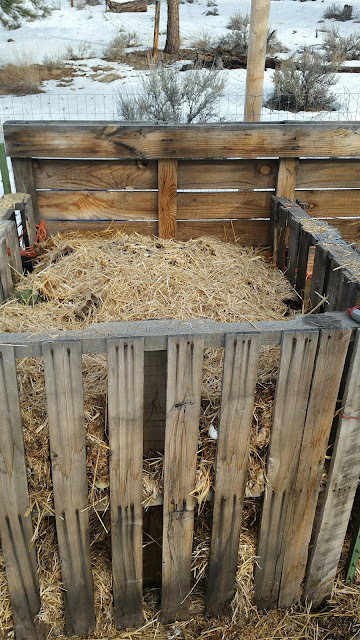 Sawdust and straw not only keep your compost from smelling, but also add small pockets of air to your compost making it unnecessary to turn your compost pile. As we becomes more and more concerned with the depleting fresh water resources found in the United States, and over a billion gallons of drinking water being flushed down the toilet daily, turning to composting toilets seems a natural step towards a solution to a formidable problem. 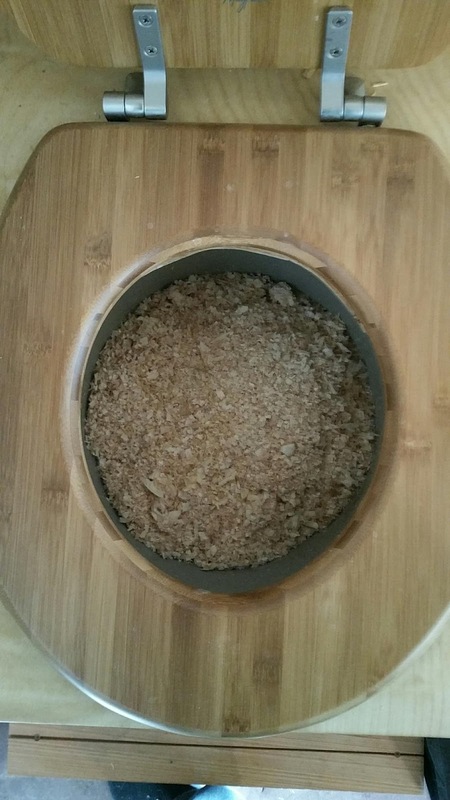 Again, I highly encourage those interested to check out Joseph Jenkins book on composting toilets and visit the composting forums found at Permies.com for more information. What about spreading communicable diseases? Shigella, Samonella, parasites like Giardia? Have you looked into that? What about medication you might take that is excreted through your urine and bowels? The Humanure Handbook is a wonderful resource for all this sort of information. All pathogens that can be found in urine and feces are killed by a combination of two factors: time and temp. The lower the temperature the longer it needs to be killed. A compost pile will sit for an entire year, without any new material, and reach substantial temperatures from natural decomposition and direct sunlight/ambient temperatures. Even in below freezing temps, our compost pile is steaming with heat. While it is important to understand about pathogens and their spread through feces, it is also important to remember that composting material from human waste is only contaminated if the person who is using the toilet is contaminated. If the medication I am using isn't safe enough to be in my garden it sure isn't safe enough for me to ingest. I like the name of the handbook. Does time and temp affect hormones, like in The Pill? Can you decompose paper with human waste, or do you put TP in the trash and burn it? I'm not sure I understand the hormones and The Pill reference. You can put anything organic into the compost bin, nothing need be burned. 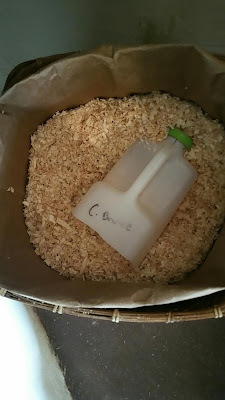 We put everything from toilet paper, to food scraps, and even small mice that the dogs "find" into the compost bin. Great post! I really like your Cob Cottage and love you and Katherine big time!